I told you strawberry season was over - but I lied. True, the strawberries I was buying, trucked in from Florida by the field owner's sister and delivered directly to our loading dock, are now history. However, I have my very own strawberry patch that might, if the gardening gods are smiling and if I can keep the birds away from it, produce a bountiful harvest of luscious berries. Look at all the blooms! 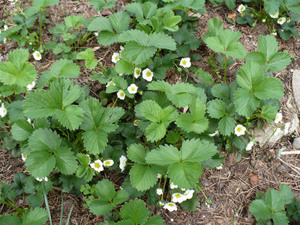 Each of those should produce a strawberry, and if I were more energetic I would thin the blooms to produce fewer but larger berries. But alas, I've got enough to do just to keep the weeds pulled (you can see I missed some!) so we will have lots of little strawberries. I need to get some mesh to put down over the berries as soon as they start to form, or the birds and bunnies will eat all of them. The patch is about 4 x 4 feet in size, and next to it I have a small herb garden, two newly-planted raspberry canes, and a newly-planted Concord grape vine. The raspberries won't produce for another year, and then only a little, but in about three years they should produce well. Same goes for the grapevine. I plan to make make jellies and preserves out of the raspberries and grapes, plus of course eat some straight from the vine and canes. I also planted a dwarf Elberta peach tree, but it too will take a few years before it produces much fruit. It now stands about 5 feet tall and had one lonely blossom this spring. If a peach forms from that blossom I'll remove it so the tree will put its energy into establishing good roots and strong branches. This year I am also trying rhubarb again. The last plant I got grew like gangbusters for three months, then died overnight. I guess it got some kind of blight, which I have never seen on rhubarb - usually it grows like a weed. My husband loves rhubarb and if we get some it's destined for a crisp (I find rhubarb pies to be pretty soggy, so I usually make a cobbler or crisp with it). The herb garden is small, but I am packing a lot into it. So far I have lemon thyme, rosemary, chives, oregano, two kinds of mint (a LOT of oregano and mint), and regular thyme. I will add basil, Thai basil, and perhaps a few others - it depends on what's at the market that catches my eye. 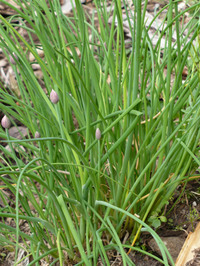 At right is a shot of the chives getting ready to bloom. I have the neighbor's children fascinated because I eat things that are growing in the ground. Last summer they assisted me in my taste tests and it was cute to see their expressions when they got a mouthful of spicy chive blossom. I got into trouble because the little girl started picking almost every plant she found and sticking it in her mouth, so I had to remind her that she should only eat things that I or her mother pick for her, lest she get sick. Luckily there are few poisonous plants around and those that are don't taste good. Once the danger of frost is past I will put out nasturtium (edible flowers), five or six types of tomatoes, tomatillos and several varieties of peppers. Hopefully we won't have a drought this year like last year and I will be able to can the tomatoes. Every year I look forward to the perfect BLT - there is nothing like a vine-ripened tomato, homemade mayo, thick cut peppered bacon (this year it too will be homemade), soft but substantial whole wheat bread (homemade if I get very ambitious), and crisp romaine lettuce. I'm salivating just thinking of it. True BLT season is all too fleeting, but what a joy the perfect BLT brings to breakfast. Oh, just seeing the plants makes me so happy! When I was a young girl, I'd sit in the middle of the plants (in our back yard) and eat all the berries---even the green ones---happily.